I was born into an Islington family in 1981 (Mum from Liverpool Rd, Dad from Essex Rd) who had supported The Arsenal through 4 generations so it wasn’t like I had any choice in the matter, they were to be my club & I’m still grateful to this day. We have our ups & downs but this isn’t a woman or a car. The only comparison I can offer is: I love(d) the players like I love my wife, I love the club like I love my sons. I’ll always be Arsenal. October 11th 1986 – A 3-1 win at home to Watford. Sounds pretty routine to most of you reading this I’m sure, but that was a special day for me as a 5 year old, it was my first ever Arsenal game. Later on that season, the old man was lucky enough to get 2x tickets to the Littlewoods Cup Final where I saw our King Kenny lift the cup, the 1st of many I’ve seen through my years following The Arsenal. I remember Anfield 89 like it was the other day, the old man went up there on the Friday night, Mum went out with my Granddad to watch it & I had to stay in with my Nan. I’ll never forget her saying just before the end “oh well at least they won the game, even if they didn’t win the league” 20 seconds later I was running around the house like a maniac! My Dad rung me afterwards & said something that I’ve gone on to tell my own kids “That’s why you’re Arsenal, boy” We went to the Town Hall parade & it felt like you were amongst your own. One big family. Through the next few years, I went to games when I got the chance, until I was 14 & after much begging my Mum finally caved in to buying me a season ticket in the Junior Gunners Enc (West Stand). That’s when it really started, all I cared about was Arsenal. My first away game soon followed the next season, we played Wimbledon away & won 3-0. That was back in the day when you could turn up on the door & pay. I went with 2 mates, we decided to tell our parents that we were going to go Brent Cross shopping in fear that they wouldn’t let us go! I was proud of myself after that, could say I followed The Arsenal away on my own. When I was 16, I had the option of staying in the Family Enc as a Cannon Club member but I’d decided that after sneaking in a few times, that I wanted to be relocated to the Clock End. Went up to Highbury, chose my seat & that was home for the next 9 years. I say home but in fact I never sat in that seat once, a few of my pals worked for the club & they were always given the obstructed view seats in the back row so I snuck in up there with them. 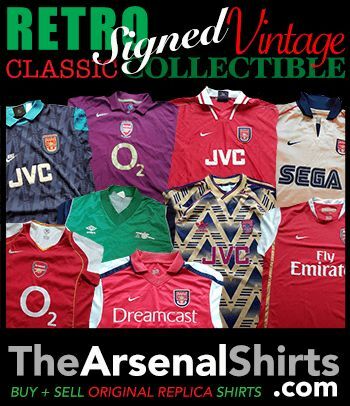 That 97 season thru to 02 were my favourite years following the Arsenal. Friendships were made that have stood the test of time & when I look back I always smile to myself. We followed Arsenal everywhere but being young we had to be inventive with the way we travelled to save a few pennies. The 99/00 season will always live long in the memory for that, we drew Fiorentina, AIK Solna & Barcelona in the Group stages of the CL. A pal found out through a friend that we could get knocked off European train tickets for £60. This ticket would allow us to travel anywhere in Europe for 1 month and as we had Fiorentina & Barcelona 2 weeks apart this seemed perfect. The goalposts moved suddenly & if we wanted these tickets we had to go to Manchester there & then to get them, it was 10pm at night & the fella was going away the next day. This was before the age of internet banking so my mate & I shared the driving through the night to get these tickets! A week later we were on our way to Florence, it took us 24 hrs to get there via God knows how many countries all to watch a 0-0 draw! We got back to the station after the game and got the over nighter back to Paris via Geneva. 2 weeks later and off we were again, Barca away. We had the experience of the 1st trip and planned it carefully, we got to Paris to find out that the over nighter we wanted to be on wouldn’t accept our tickets & that we’d have to pay another £150 each if we wanted to board. We couldn’t afford that & after a bit of blagging we found an alternative route which took in 4 trains. The trains were packed & that night I found myself sleeping on the floor in an aisle. If you think that’s bad, trust me it gets worse. We finally got to Barca around midday & after a 24hr bender, we managed to nick a point at Camp Nou with only 10 men. After the game we returned to the Main station to find out the train we’d hoped to jump on back to France was cancelled & there wasn’t another one until the morning. I remember we all had between £10 & £20 each on us & had no hope of getting a hotel so we had to sleep rough. We went & bought a load of beers & a football, we started to have a kick about in the Main Square & ended up playing a match against a load of Spanish (tramps I assume) blokes. Finally my body gave up & I ended up falling asleep on a park bench. I got woken at 6am & we started the journey home which took another 24hrs. I mention these trips as this is what I was prepared to do to follow The Arsenal. At the time, I felt horrible & hated it. Looking back now, the memories I have I’ll take to the grave with me! Later that season we drove to Bremen, Lens & Copenhagen all through the night & everyone of them trips were the nuts. Win, lose or draw we had a proper crack. I’m lucky enough to have 2 boys myself these days & can already see the passion inside them both for The Arsenal. Bar those 2 boys, The Arsenal is the love of my life & I can’t wait for them 2 to make their own memories following our great club. This entry was posted in Arsenal and Me and tagged Alex Oxlade-Chamberlain, Arsène Wenger, Arsenal, Arsenal F.C., Barcelona, Brent Cross, Camp Nou, Premier League on August 22, 2013 by keenosafc.